The Anchor Hocking Glass Company, once the world's largest maker of glass tableware, was the base on which Lancaster's society was built. As Glass House unfolds, bankruptcy looms. 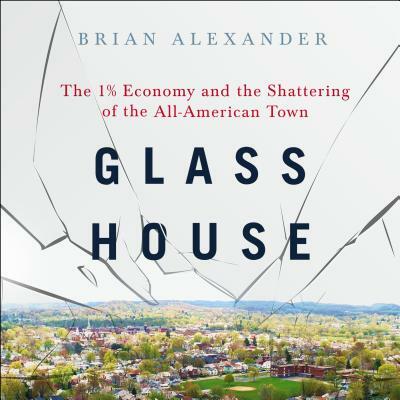 With access to the company and its leaders, and Lancaster's citizens, Alexander shows how financial engineering took hold in the 1980s, accelerated in the 21st Century, and wrecked the company. We follow CEO Sam Solomon, an African-American leading the nearly all-white town's biggest private employer, as he tries to rescue the company from the New York private equity firm that hired him. Meanwhile, Alexander goes behind the scenes, entwined with the lives of residents as they wrestle with heroin, politics, high-interest lenders, low wage jobs, technology, and the new demands of American life: people like Brian Gossett, the fourth generation to work at Anchor Hocking; Joe Piccolo, first-time director of the annual music festival who discovers the town relies on him, and it, for salvation; Jason Roach, who police believed may have been Lancaster's biggest drug dealer; and Eric Brown, a local football hero-turned-cop who comes to realize that he can never arrest Lancaster's real problems.